Several arthropod pests feed on hazelnut foliage and damage nuts. Our lab is studying management options for several of these pests. 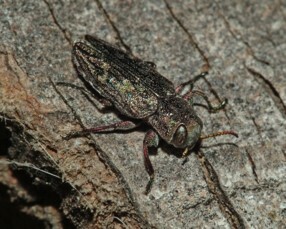 Pacific flatheaded borer (Chrysobothris mali) is a beetle that damages stressed young trees. Borer damage can be avoided by reducing plant stress through adequate irrigation, preventing sunburn by painting trunks with a 50/50 mixture of white latex paint and water. Maintaining balanced nutrient levels is also key to healthy trees. Shot hole borers are small black beetles, which bore into trees and create multiple galleries radiating out from the center of the trunk. Ambrosia beetles cause damage by inoculating trees with a fungus, which adult beetles maintain for feeding their developing offspring. The beetles can persist in the trees for multiple generations. The lab is currently studying development of Pacific flatheaded borer, emergence from overwintering sites, and insecticide management options for combating these pests and increasing tree longevity. These pests feed on developing buds and prevent nut development. Since most of their life cycle is spent protected within developing buds, they are difficult to manage. Timing of pesticide applications is critical to manage bud mites, since they must be sprayed when exposed. Mites can be monitored using double sided sticky tape, and this information can be used to determine when management will be most effective. 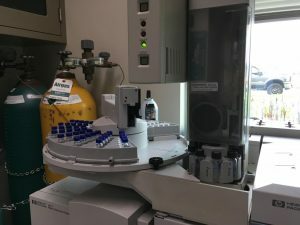 The lab is monitoring population movement in the Willamette Valley and testing pesticide options that might be less damaging to natural enemies. 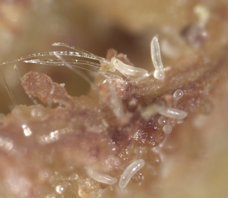 It is critical for chemical management to coincide with the migration of bud mites in spring, usually between March and May, because this is when bud mites are most vulnerable to sprays because they are no longer protected by the bud exterior. It appears that peak migration occurs when maximum temperatures are above 59 F or average temperatures hover around 48 F, and are part of a long term warming trend. It is also possible to monitor for bud mites by placing traps, which consist of double sided sticky tape, below fresh blasted buds. These traps should be checked weekly, and since the mites are extremely small, it is often necessary to use a microscope or hand lens. We found a three-week difference in peak migration between 2016 and 2017, which was due to much cooler temperatures in 2017. There are currently very few products that are registered for use against bud mites in hazelnuts (Abamectin and Envidor are commonly used). We have tested additional chemicals, some of which have shown sufficient efficacy as to be added to the list of approved products. Fujimite is a classic mite material used against bud mite, and is registered for use in hazelnuts. Bexar is registered for use against filbertworm, and we hope to add this for use against bud mite, as well as Kumulus, which is a micronated sulfur. 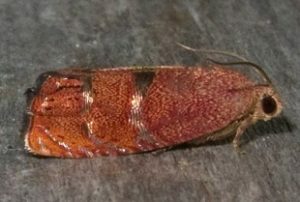 Filbertworm (FBW), a (Cydia latiferreana) a moth native to North America, is especially challenging to manage. This insect overwinters as a larva in leaf debris. Adults emerge from June – October and lay eggs singly near maturing nuts. After hatching, the larvae bore into acorns and hazelnuts. Reliance on a single mode of action and making repeated applications greatly increases the likelihood for resistance to develop. 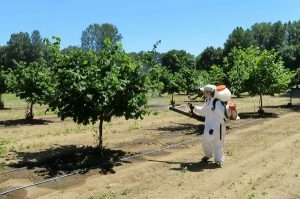 Organic growers depend heavily on spinosad (Entrust) to control this pest because it is one of the few OMRI-listed insecticides available to growers. Loss of efficacy of spinosad would be devastating for Oregon’s organic industry. Growers are also limited in the total amount of a product that can be applied in a single year, and if there is only a single product (e.g. Entrust) that is effective, the maximum allowed usage (3 applications) is easily reached before the end of the season, leaving growers with no alternatives for controlling the pest. Therefore, it is essential to evaluate current FBW control strategies and find new solutions to control this pest. 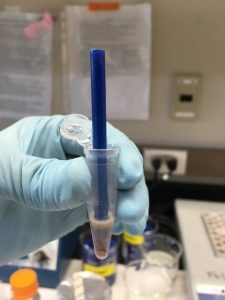 While pheromone-based mating disruption is available to growers, this technique only works when the adult population is already reduced to a manageable level. This is not the case for a majority of organic growers. Most growers also control moths culturally by flailing nuts that drop from the trees early. But it is still extremely difficult for organic growers to manage FBW to the same damage tolerance levels (1% damage) as conventional growers and have their nuts accepted at a processor. 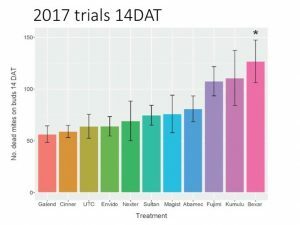 In summer 2017, we evaluated efficacy of several insecticides against FBW. We hope to secure funding in 2018 to to increase the number of replications and expand our organic insecticide selection for chemical trials. 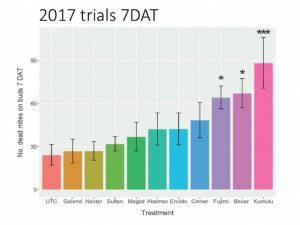 The insecticide trial results will be incorporated into a management strategy that can be administered in organic orchards, which use both chemical and cultural controls. The management strategy will describe methods for monitoring with traps, how to time chemical applications to coincide with FBW egg hatch (the insect is most susceptible to chemical treatments when it is in its larval phase), and recommended rates of effective chemical products. Cultural control practices such as flailing nuts that drop early, which often contain blanks or FBW, will be described. 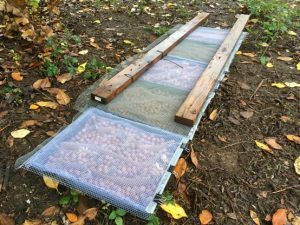 Mating disruption, which can be useful for organic growers who have low to moderate pressure and are not located near heavily infested hazelnut orchards, will also be discussed. Finally, the plan will describe banded mass trapping, another method for reducing FBW pressure where bands of corrugated cardboard are wrapped around the bases of hazelnut trees, and larval FBW that migrate into the cardboard are removed from the orchard and destroyed. Explanation of chemical efficacy results: UTC is untreated control, Asan is Asana (esfenvalerate), En+O is Entrust (spinosad) mixed with horticultural oil (mineral oil), Altc is Altacor (chlorantraniliprole), Srrn is Surround (kaolin clay), Cydx is CydX (codling moth granulosis virus), Entr is Entrust, AzDr is AzaDirect (azadirachtin), Vnrt is Venerate (heat-killed Burkholderia spp. strain A396 cells and spent fermentation media). Asana was our industry standard. This pyrethroid spray is often applied by conventional growers. 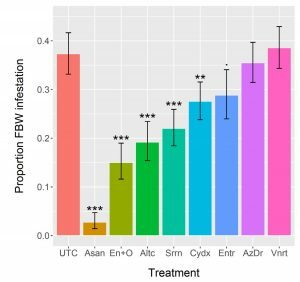 * above treatments indicate significant differences in FBW infestation. 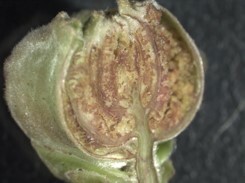 Growers who have high FBW pressure in their orchards may become concerned that FBW are feeding on acorns as larvae, and then migrating into their orchards as adults. 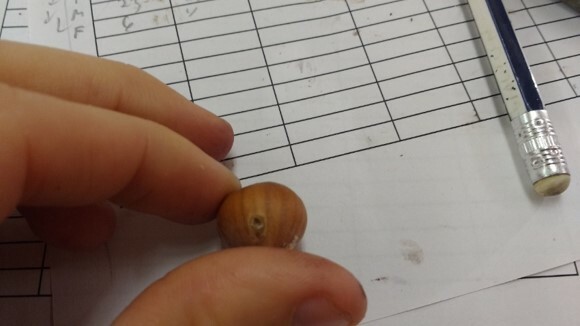 Since FBW feed on additional nut species including oaks, prophylactic insecticide treatments to oak trees surrounding their hazelnut orchards may prevent FBW migration into into the orchards. Yet, there is scant evidence to support this management recommendation. In 2017, we initiated a trial using lipids (fats) of FBW raised on different diets as larvae. 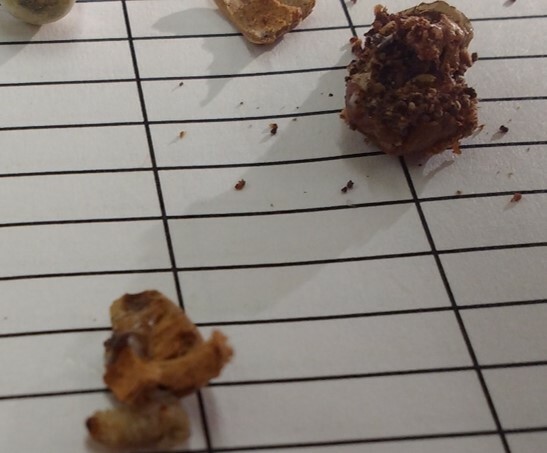 After feedong on acorns or nuts, FBW are grinded and analyzed using gas chromatography. In phase two we will deploy FBW traps into hazelnut orchards and analyze the lipids of FBW captured in the traps. If the FBW contain lipids unique to FBW raised on acorns, that will indicate adult FBW are migrating into the orchard from oaks. If this is the case, rather than spraying giant oak trees with insecticides, it could be helpful to hang additional monitoring traps along the edge of the orchard and apply border sprays to the hazelnuts when trap catches hit thresholds, to target incoming moths. Oak trees are fabulous habitat for roosting raptor birds, which eat rodents that get into orchards, and oaks provide food for all sorts of animals, such as wild turkeys, so it is beneficial to avoid damaging oaks.